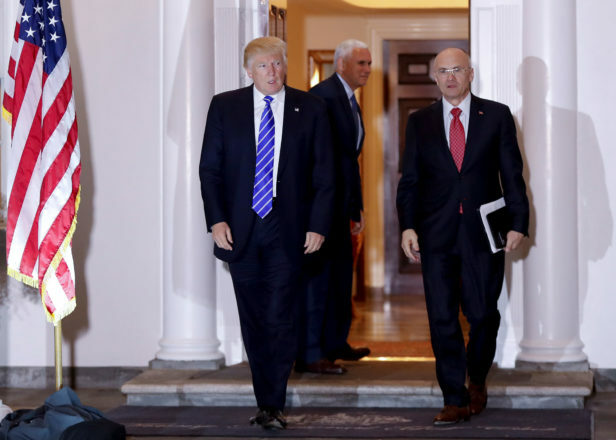 President Donald Trump walks with his nominee for labor secretary, Andrew Puzder, in November 2016. President Donald Trump’s nominee for labor secretary really doesn’t like minimum wage increases: He once spent $10,000 to oppose a pay bump of one dollar an hour. Andrew Puzder, CEO of the company that franchises Carl’s Jr. and Hardee’s restaurants, gave the money in 2006 to battle a Nevada ballot measure to raise the state minimum wage from $5.15 (the federal minimum wage at the time) to $6.15. The donation put him among the top 10 donors trying to prevent the wage increase, according to the National Institute on Money in State Politics. Fast food companies and the National Restaurant Association outspent labor unions supporting the measure, but voters overwhelmingly approved the raise, with nearly 69 percent of the vote. As a result, Nevada’s wage is still one dollar above the federal one, at $8.25 per hour, today. Employers can pay a dollar less if they provide health benefits. At the time, the opposition campaign Puzder helped bankroll argued that a wage increase would lead businesses to employ fewer workers. That’s a common argument, and one debated by economists. Puzder has been an outspoken critic of minimum wage hikes — as well as the Affordable Care Act and an Obama administration rule to expand overtime pay. His critique of wage increases has often been set against the movement to raise it dramatically, to $15 per hour. He’s said in more recent TV appearances that he would be OK with hiking the minimum wage “rationally,” such as a boost from its current $7.25 to $9.00 per hour. “I’m fine with raising the minimum wage to the point at which it doesn’t destroy jobs,” he said on CNBC last May. But the $1 increase in 2006 was reasonable by almost anyone’s definition, said Ross Eisenbrey, vice president of the left-leaning Economic Policy Institute, which opposes Puzder’s nomination. Puzder did not respond to requests for comment.